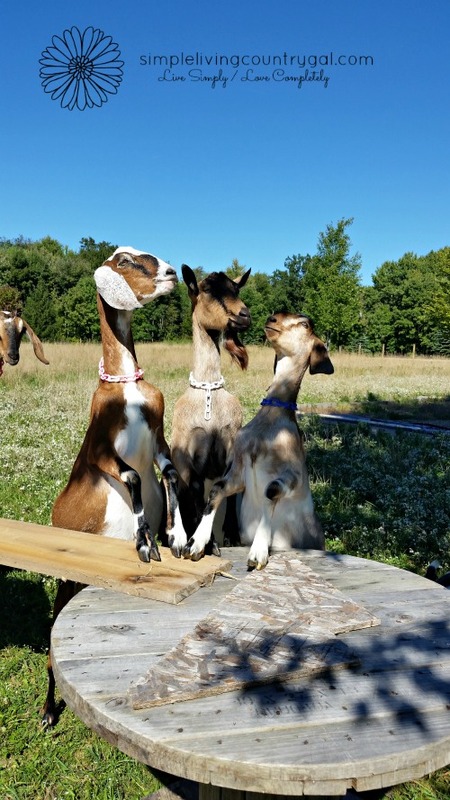 If you have goats, you know one thing. Goats just love to climb! A wood pile, a hill, a tractor, heck even a concrete block will do the trick. I have this old plastic exercise step in my barn that I put in for the goats a few years ago. My gals still fight over who will get to stand on that thing! One day I realized my goats needed a playground (a free DIY goat playground) to climb on, especially the kids. I scoured the internet and saw lots of wonderful ideas, but I am cheap (to a fault) and needed something that was not going to cost me any money whatsoever. It is quite comical to see my herd clustered on that hill looking around as if they are hundreds of feet up! I told Hubs that I wanted to make something for them to climb and play on. I contacted a friend who was able to get me a few spools left over at the local power company. Spools are wooden cylinders and used for housing electric wiring. They are very sturdy and come in two sizes (that I know of). In our area, they are quite easy to get and are free just for that asking. Your area may have different rules so you will need to check first. To find out simply call a local contractor and ask or you can call the local extension of your electric company. More often than not they are thrilled to get rid of your spools and will actually deliver them too! These spools are simply the greatest things ever and if you have animals on a homestead you might just grow to love them too. On our little farm, we have them sprinkled throughout our barn and pasture. They are sturdy, heavy duty and surprisingly easy to move…even for me. Just tip it up onto its side on and roll! Please be aware that most spools do have holes on either end that are just large enough for a goat’s hoof to get caught. This is easily fixed, however, by simply screwing on a scrap piece of wood just large enough to cover the holes. We are not looking for pretty here, just keeping the goats and their kids safe. You will want to position the spools a short distance apart in a nice area. I like to keep ours in a shaded area during the hot summer months and in a sunny area during the cold winter months. For our setup, we placed the larger spools in sort of a half circle and the smaller spool I put in the middle of the playground. This will help make the playground easy to access for all of my goats including the young kids. 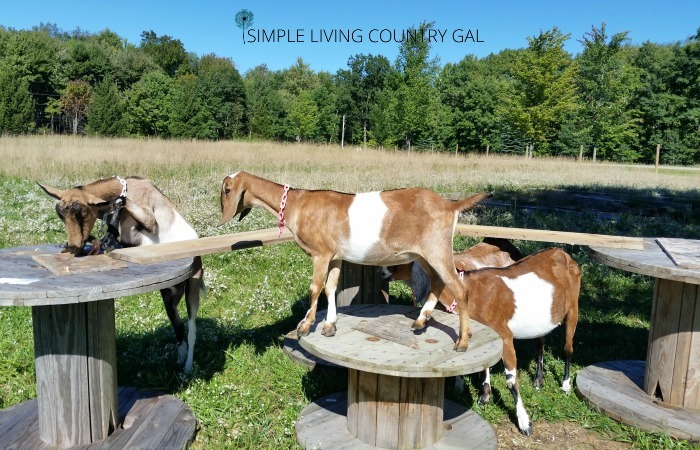 The smaller spool is perfect for the younger goats to use as a sort of step stool so they can more easily jump up onto the bigger spools. This is not something you have to do, but the more “fun” you put into their free goat playground the more they will use it! For our playgound, a bridge was needed to give more of a challenge to the herd. Hubs dug out a piece of leftover hemlock and cut it into two 6 foot pieces. I positioned them so there was about a foot on each spool and screwed it securely in place. I was happy to finally display my mad construction skills! For some reason Hubs tends to hide all power tools from me. 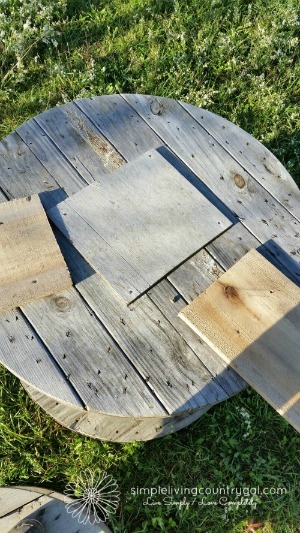 Just know that once you add those planks moving your playground setup will be next to impossible without first removing the planks. For that reason, I suggest you screw them in rather than nail them. The hardest part of the whole project was getting my girls to try the playground out. Heaven forbid I ask them to do anything that requires effort. I finally jumped on myself and lured them up with fresh maple leaves (which they just LOVE). Maybe that was their intention all the time? To get ME up on that contraption walking and parading to my neighbor’s delight. The young ones explored it the most, but eventually, my older does were up having a grand old time. I know quite a few people will purchase play sets at yard sales to use and this is a great idea. I, however, was looking for a more rustic look. I really wanted my playground to blend in and not stand out so much. 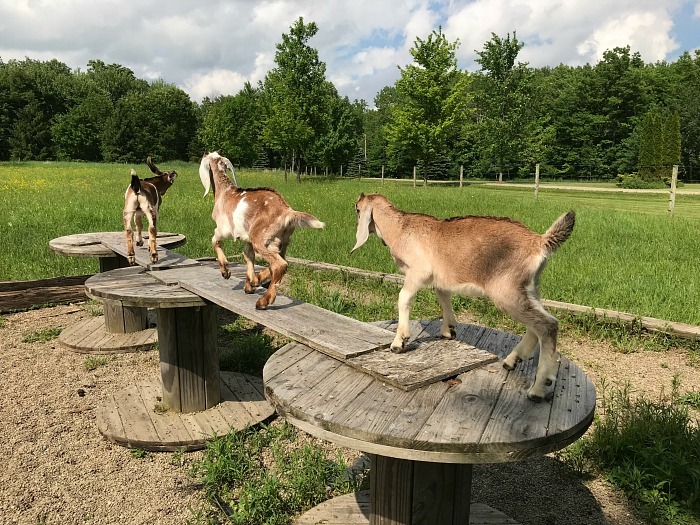 Plus, my gals are big Nubian full breed goats and I know a Little Tikes slide simply would not last long with them playing on it. One of the best things about being a homesteader is learning to think outside the box. More often than not, what I am looking for can easily be made with what I already have on hand. Just a little imagination can create a playground for your herd that they will use and love! 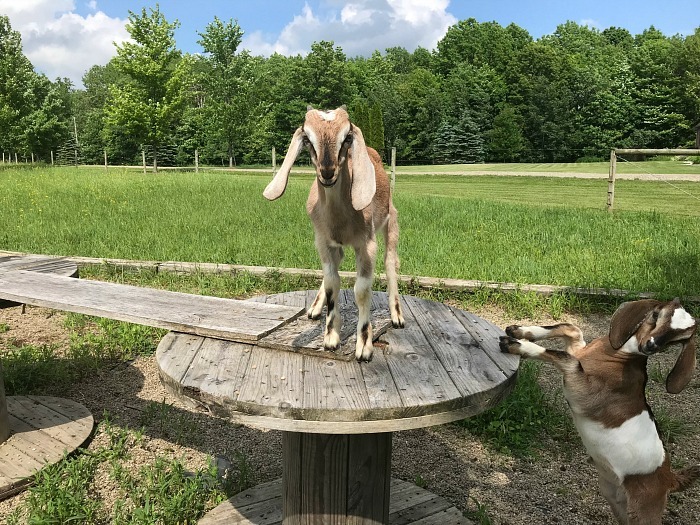 Update on our DIY goat playground! 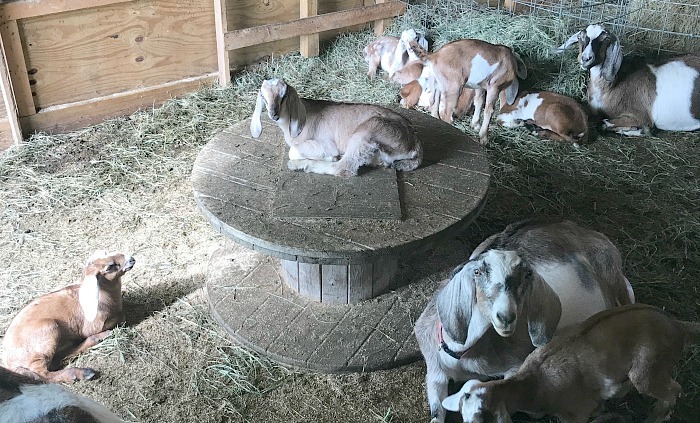 Since I have posted this article, many goats have played on these spools. All in all, they have held up pretty well the last three years. We have since moved them to our gravel pit in the pasture, which is actually where my people kids had their very own playground when they were younger. The little goat kids LOVE this DIY goat playground and the mothers are happy to get a break from nursing. 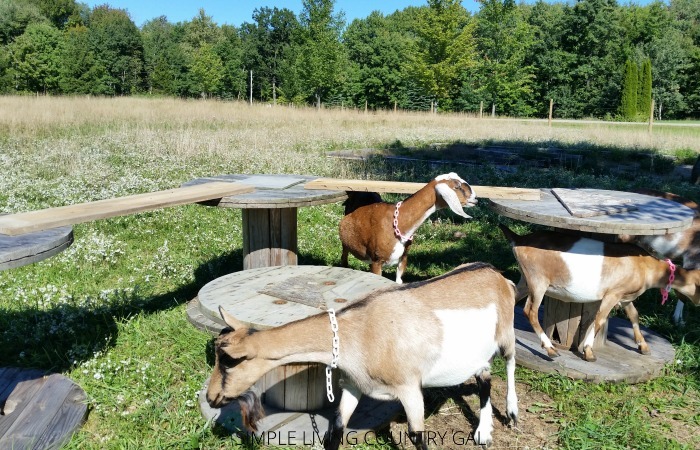 Having a playground is not essential but it is amazingly helpful when training young goats to behave better. The playground helps them learn how to socialize with not only the other kids but with the other moms too. It also helps them to learn agility, work off some excess energy, and even introduce them to water and feed quicker. As they play they get thirsty and if mom is not ready to nurse they are forced to find other ways to drink. I like to have a bucket of water close by for this reason. I find the quicker they learn to like water the easier it is to ween them when the time comes. I just amazes me how kids only a few weeks old have such fearless balance! 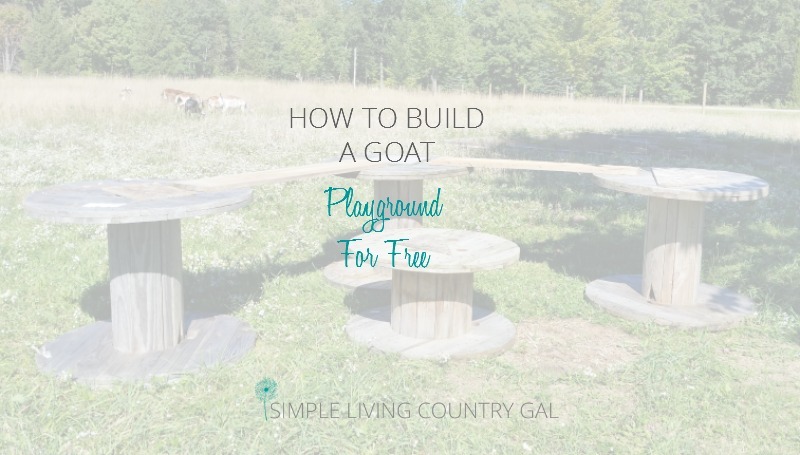 Projects like this DIY goat playground are just all a part of being a homesteader so it is only natural that a free goat playground will be at the top of our list. Channel your inner MacGyver skills and you will be amazed at what you can make out of nothing! This sounds like a lot of fun for your goats. I’ll have to keep my eyes open for some empty spools. 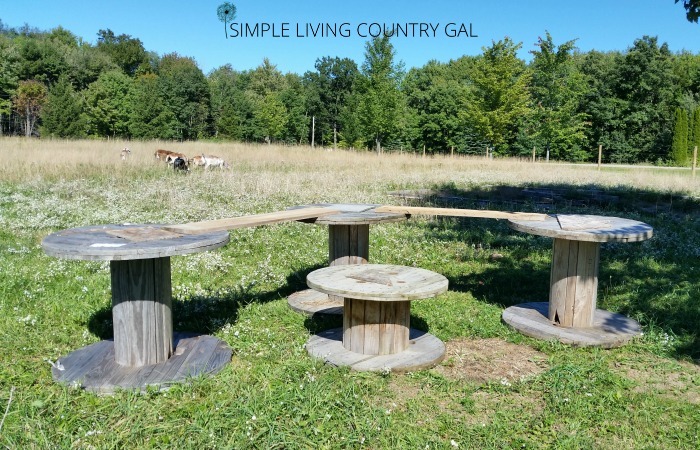 Thank you for sharing at the Our Simple Homestead blog hop. I have several different ways I keep my goats fenced in. I have cattle panels (5 foot high) for my permanent small areas off the barn. 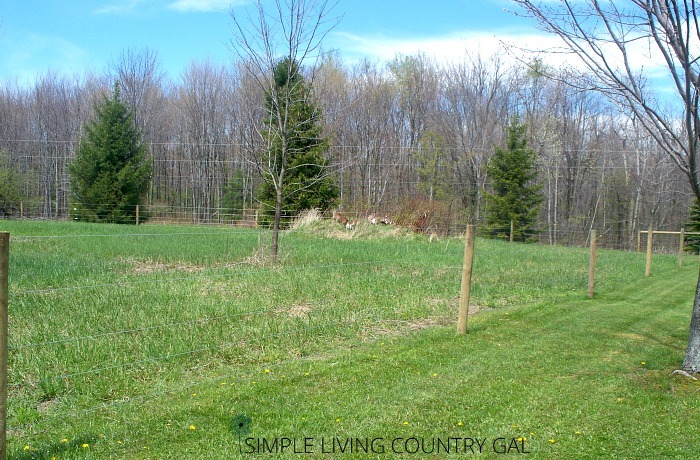 I then have electric netting for my bucks grazing area and high tinsel fencing for my main pasture where my does are. The easiest to move is the electric netting which is great for rotational grazing. I have only had 1 escape and if you have a bucket of feed and your goats are trained they come right to you. 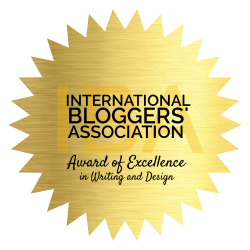 🙂 I am doing a new post on fencing next week, so check back or you can sign up for my email so you don’t miss it. So glad you are here, Marie! What about toys for horses, chickens, rabbits, or guineas(because they aren’t like chickens).